Don't believe we have this "PADUCAH PACKET" waybill on any of our pages. The identity of the boat is uncertain . 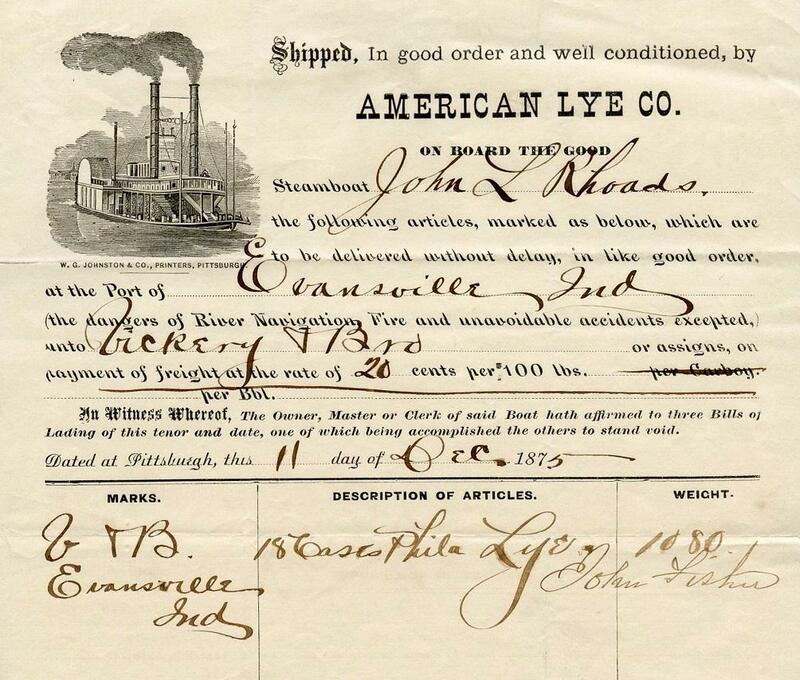 . . this could have been a "generic" waybill that was used by the Evansville, Paducah & Tennessee River Packet Co. to designate where the steamboat's voyage began or ended. 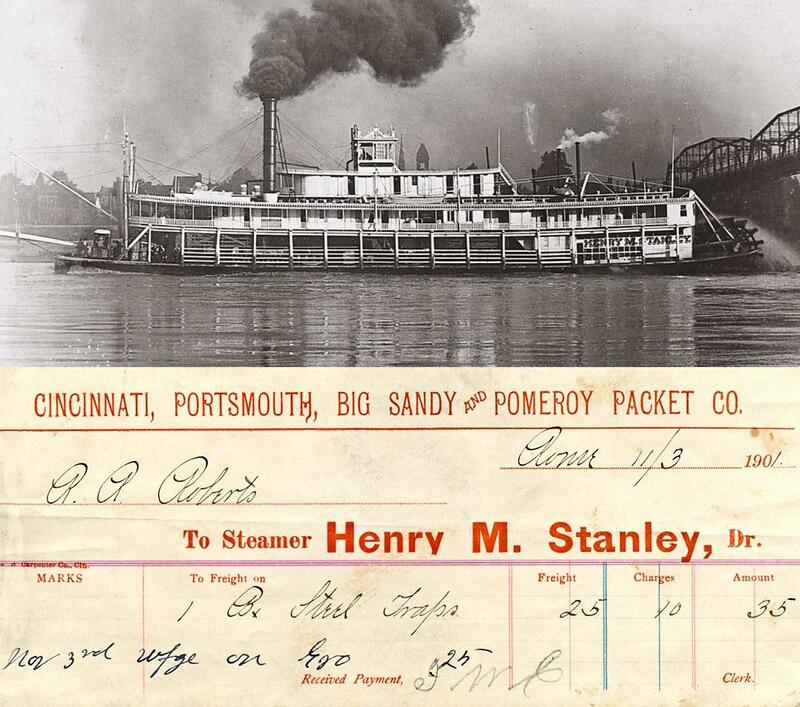 Can't find a boat named "PADUCAH" or "PADUCAH PACKET" circa the 1880's listed anywhere so the identity is a bit of a mystery. The date 15th of August 1888 and lots of printed and handwritten words, may provide a clue. The Pott Library in St. Louis has waybills from the same company filled out in '86 and '87 for steamers SILVER CLOUD, JOHN GILBERT and W.A. JOHNSON. A complete list of all of E.P. & T.R. 's boats might yield further evidence. Built at Pittsburgh, PA. in 1875. 222 x 36 x 5. Engines, 16's- 5 ft.
Three boilers, each 38" by 26 ft. Built for Capt. John L. Rhoads and others of Pittsburgh. In May 1878 she had made 28 round trips to St. Louis and two more to New Orleans from Pittsburgh, then commanded by Capt. J.M. Vandergrift with John C. Fisher, clerk. Sank on the Falls at Louisville, June 1877, raised. Ran low water, Cincinnati-Madison, fall 1877 Captain Rhoads lived in a white frame atop the hill at Haysville, Pa. still standing 1978. Capt. David Silver and others bought the RHOADS, renamed her CHAS. C. CARROLL. 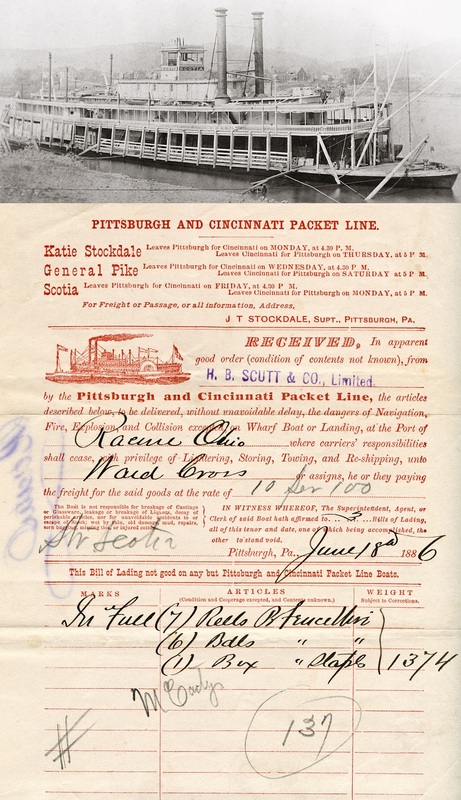 One year and seven months after the Steamboat-Inspection Service issued this permit (on May 19th, 1900) to the KANAWHA BELLE for her to carry excursion parties, she was lost in a freak accident on December 19th, 1901 when the pilot "Musty" Snyder came on duty at night assuming the boat was bound upstream. Unbeknownst to "Musty" the boat had been turned around and was now heading back downstream. Mistaking a light on a lock wall for a light on a fleet of coal barges "Musty" steered the boat into the middle of the river where it went over the dam at Lock Number 3 on the Kanawha River. Nine lives were lost and eight were saved. 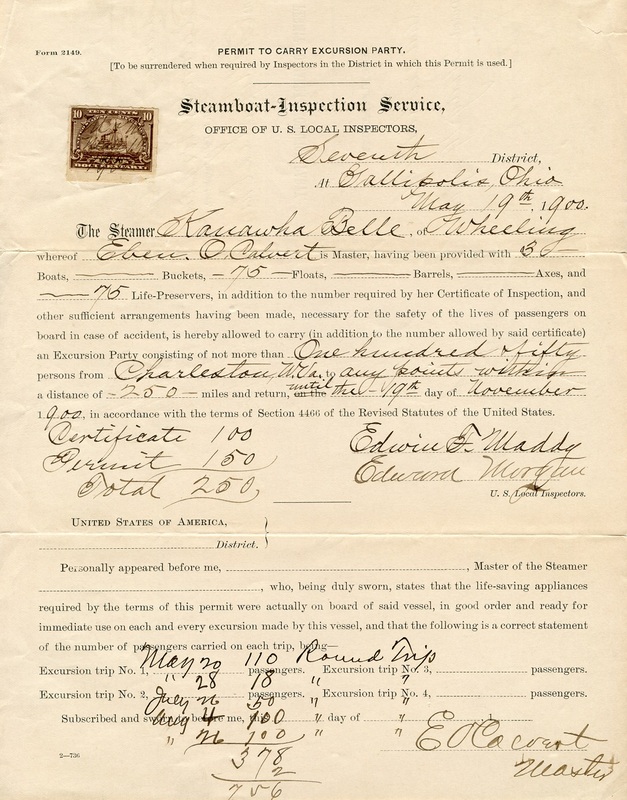 On the cover of this document it is written that it had been returned to the inspectors on December 10, 1900. Built in Harmar, Ohio in 1887. Originally named BELLAIRE and was given a cabin and alterations by the Calvert family, on the Kanawha River, renamed, and ran Charleston-Montgomery. On the night of Dec. 19, 1901, she plunged over the fixed dam No. 3, Kanawha River. Eight were drowned, one died of exposure, and eight were saved. Capt. E.O. Calvert was in charge, and 'Musty' Snyder was pilot. The official report says 'the pilot thought he was going upstream.' This odd statement came about inasmuch as the boat had been proceeding to Montgomery, plans were changed, and she was turned back toward Charleston. 'Musty' Snyder came on watch, unacquainted with the switch, and in the darkness thought he was upbound, saw the white light on the lock wall, thought it was on a moored coal fleet, steered out in mid-river to miss it, and went over the dam. The machinery was salvaged and went on the J. Q. DICKINSON." 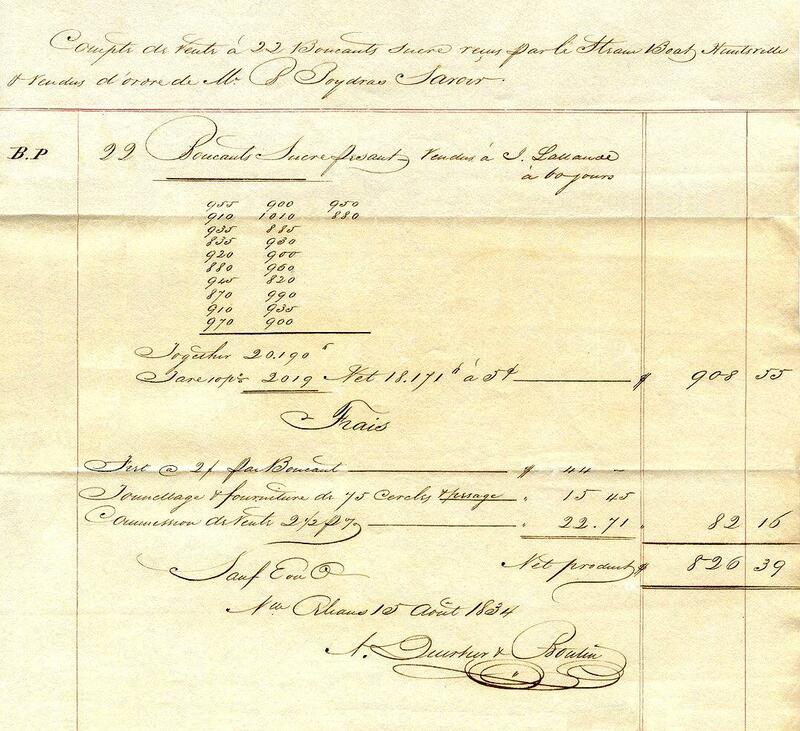 This January 17th, 1852 waybill from the GRAND TURK is a real rarity.The image is a detail from Hippolyte Sebron's 1850 painting GIANT STEAMBOATS AT NEW ORLEANS which is owned by Tulane University. First home port, St. Louis, Missouri. She ran Louisville-New Orleans. The ANDES was cheaply built, without skylight in the cabin and other amenities. Ran Cincinnati-Madison until the big Cincinnati fire in November 1922. 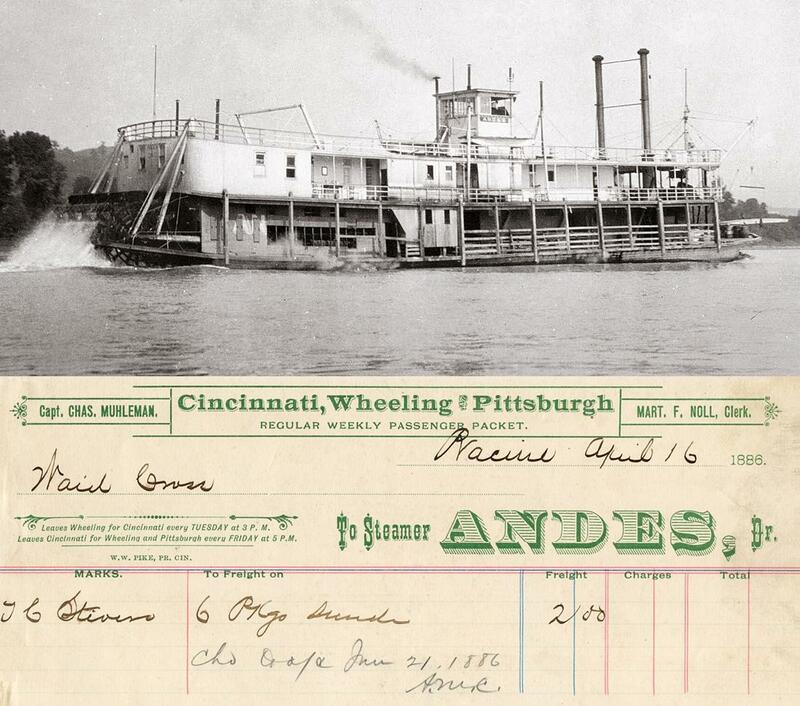 Greene Line Steamers ran her under charter in upriver trades for some time; sold in March 1927 to Captain Oliver F. Bradford in New Orleans. Sank and was lost while approaching Plaquemine Lock, July 1, 1931. 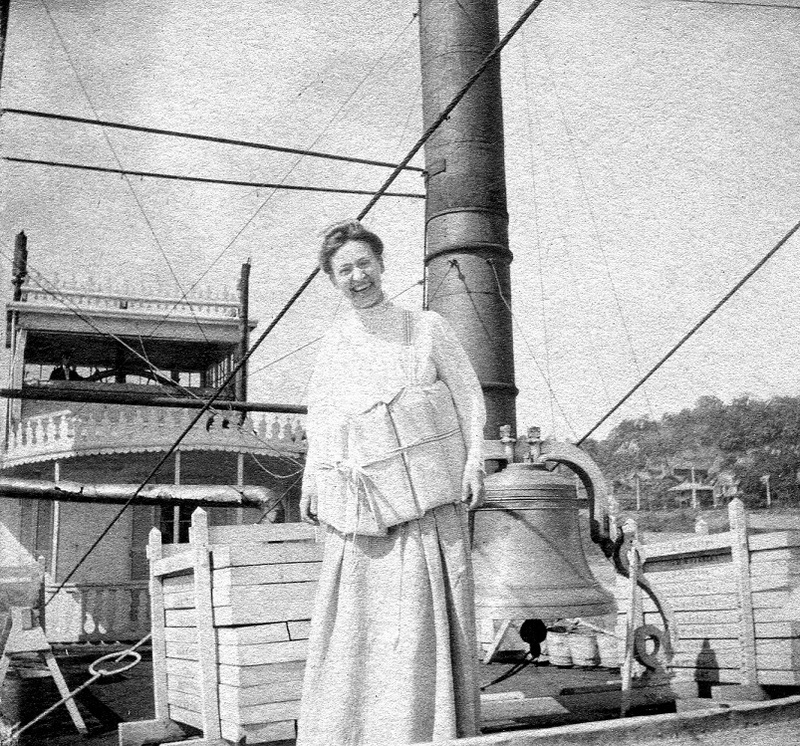 Original cyanotype (blue "proof print") postcard from my collection, showing Miss Margaret E. Johnston aboard the HENRY M. STANLEY wearing a clumsy looking life vest that's a couple of sizes too big for her. 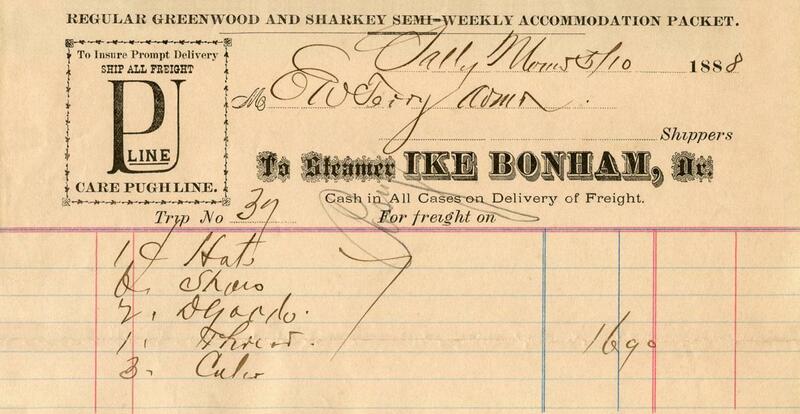 Handwritten waybill in French for bales of cotton transported aboard the "Steam Boat Huntsville" New Orleans, 1834. The penmanship is accomplished and the signature on the bottom a real work of art in itself. Built in Mason City, West Virginia in 1878 at at the Mees Yard, above the city wharf for Captain W.H. Sargent. 93 4 x 18 x 3.6 Ran on the Kanawha River in 1879. Capt. Sargent then took her to the Yazoo River. On March 11, 1886 her boiler exploded on the Mississippi 11 miles below Vicksburg with loss of life. Capt. Sargent was not aboard but Mrs. Sargent kept a cool head; helped extinguish a resulting fire and aided with rescue work. [See S & D REFLECTOR, March 19, 1978, page 5]. Ran excursions occasionally between New Orleans & Grand Isle. The BONHAM sank in the Yazoo River and was lost in 1893.